I pinned these Kitty. I love spritz cookies. Kitty, your spritz cookies are so festive and pretty too. I love your nativity from your children; it's adorable and so lovely at the same time. I know well how much we love those treasures given to us by beloved friends no longer with us. Enjoy this last week before the Holidays, dear Kitty. Merry Christmas! I am baking today so will mix these up so I can chill them. I like the idea of working with an easy dough as I have had troubles with my cookie maker before. 😉 Gosh those two grands look alike! Dear Kitty, what a beautiful platter! And of course that handsome grandson is such a cutie! I hope that you and your family has a very Merry Christmas dear friend. P.S. I sent you an email. 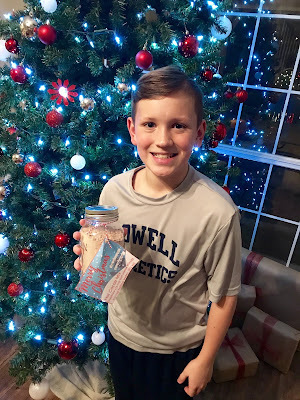 I’m a new reader of your sweet food blog and it’s such a heart warming and it brings me a smile. I love the coordination of the cookie, napkin, plate, tea cup and a doll with such sweet memories. Also love the nativity set that was given by your children. I have 4 kids, too and I should put that into my Christmas wish list next time. I have to try this recipe with my girls this weekend. Blessings, Rach. Those cookies are the just the thing for the festive season. The nativity set gifted by your children is beautiful. It is lovely to have memories that dear friends and family have gifted us over the years, isn't it. They bring back sweet memories of beautiful times shared. Gorgeous photo of Caiden in front of your beautiful tree. Hi Kitty!That plate is gorgeous!Love your Nativity and your cute Grand!The cookies are pretty and look delicious.Merry Christmas! Calden is really cute and looks like a happy young man. I love spritz cookies and used to make tons of them every year. I am not baking this year---so much of my stuff is packed away for our move in spring. Sweet memories, old and new. I have that same angel, Kitty, from sometime in the 90s. Have a very Merry Christmas! Sweet post, Kitty! I used to have a spritz press and enjoyed making these cookies. I may need to add one to our kitchen again. Happy Holidays! Oh, I love your manger scene! It is just beautiful! I am so thankful you are enjoying this Christmas season, sweet friend. :) Praying for you! 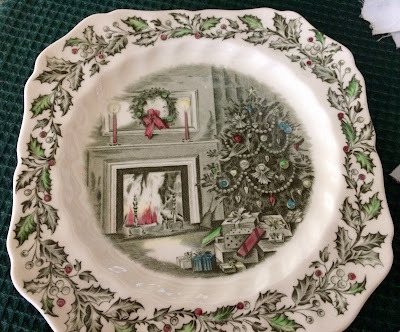 I absolutely love the pattern on that plate and the angel is a lovely cherished gift. The Nativity set is just beautiful! My mom used to make these and I couldn't find the recipe this year so thank you for sharing. Have a wonderful day! What a lovely seasonal tea by the fire! Your manger is beautiful. I'm also a fan of the JB Merry Christmas. I don't think I've seen that pattern around here. I'm sure your grandkids will enjoy the homemade cocoa. Merry Christmas! Merry Christmas Kitty! I agree your Johnson Brothers is perfect! I haven’t made spritz in years...not sure why not! We certainly love them! 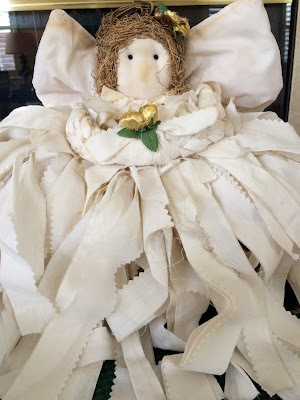 Love your angel and nativity. I have several gifts that come out for Christmas...wouldn’t be the same without them! Have a festive and joyous Christmas week with your dear family! Treasures all! Thanks so much for linking to Tuesday Cuppa Tea. The spritz cookies are adorable. And a perfect fit to your napkin, I love that. Happy Holidays. What a handsome grand...his smile must light up the room. I love the memories associated with gifts from those we love. I have several ornaments that friends made me MANY years ago, though they are no longer with us. 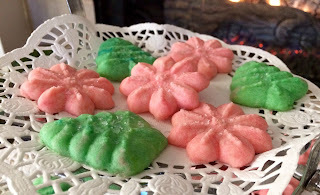 I am a BIG fan of spritz cookies mainly because they are so pretty and easy and quick to make. Great tip about chilling the dough. I've never done that but will next time! Have a wonderful Christmas my friend! The cocoa mix is such a great idea and what a handsome helper you had! I love your precious angel and pretty dishes! Merry Christmas! 350° ? My dough has been in the fridge for two days! Yikes. They still taste fine...very much a melt in the mouth cookie. I love your grand kid photos and Caiden is a cutie! Thanks for sharing another delicious recipe with these cookies. 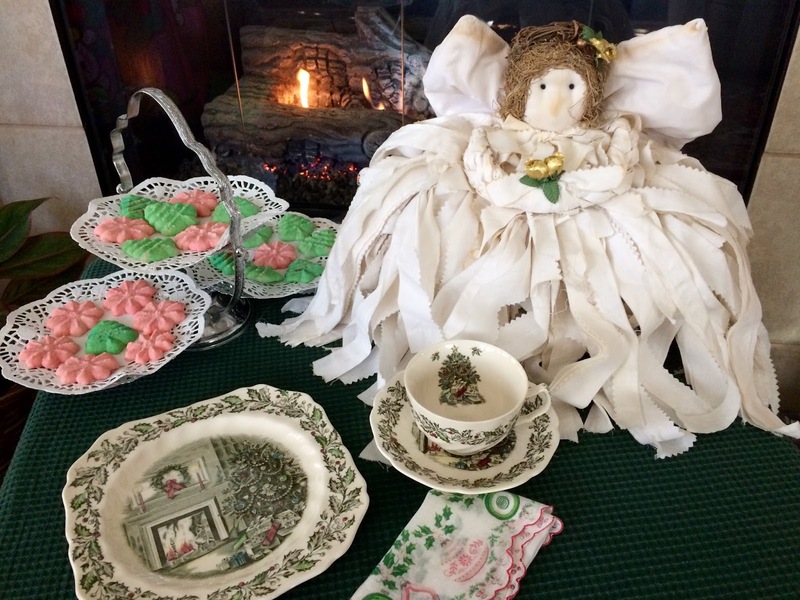 That is a very darling shabby angel there! Merry Christmas Kitty and thanks again for that darling ecard. Great fun! I wish that I loved making cookies as much is I love eating them. Christmas just isn't Christmas without Spritz cookies, so I hope somebody bakes some and gives them to me! Yours look beautiful, and I'm sure they are delicious. Merry Christmas to you and your family, and have a wonderful new year. Your Spritz cookies are wonderful. I made some years ago. Love your dish ware, how charming the design is. Caiden is a charmer. Both he and Cissy are so lucky to have you for their nana. Creating wonderful memories together.Merry Christmas dear Kitty. Merry Christmas and Happy New Year Kitty! Your spritz cookies are wonderful. I made some this year, thanks to Lynn and her spritz posts. Caiden and Cissy are so lucky to have you for their nana. Kitty, lovely. Yes, it's always a good idea to chill spritz cookies before baking. I haven't made any in years, but now that I've seen yours I'm craving them! Hi Kitty, those cookies look so good and it's always nice to use recipes from our blogging friends. I love that you made the cookies in red and green. Your manger set is beautiful. Wishing you and your family a Merry Christmas and a Happy New Year. Oh Kitty- what a sweet post! Your sprintz cookies are award-winning perfection - always wanted to make those and never have! I have a cookie press that has been unopened for over ten years - I think you've inspired me! Maybe I will include them in my holiday baking next Christmas as this one is upon us! Merry Christmas and a very HAPPY New Year, dear friend. BIG hugs and love. Kitty, I too love special gifts that evoke memories of loved ones. the cookies look so yummy, and I love your dishes! You ae such a wonderful grandmother! Thanks for sharing with SYC.